Welcome, this week learn how to turn every phone call into a new client by making a great first impression, also learn about the national winners in this year's Australian Family Early Education and Care Awards. In many instances a parent's first contact with an early childhood education and care provider is over the phone. The importance of that initial contact cannot be overlooked and will in many cases determine the likelihood of a parent coming in to view your service in person. While many providers, especially smaller operators like family day care educators, may not be able to afford to have someone solely responsible for answering the phone, that is not an excuse to neglect this line of communication. Every phone call you have with a prospective client is your opportunity to convey your personality, professionalism and the aspects of your service which are unique. This article based on Phone Answering Tips for Child Care Centers by Cathy Abraham offers strategies for successfully converting phone calls to customers and highlights the importance of ensuring all your staff are trained to positively manage phone calls. 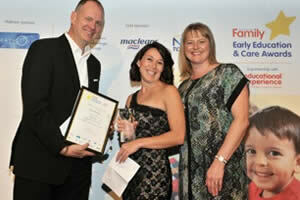 Australia's outstanding early education and care professionals were recognised and celebrated at the 2014 Australian Family Early Education and Care Awards held in Sydney last week. Early Childhood Service of the Year Balnarring Preschool (Vic). This winners join Ellyn Taylor from Avalon Beach House Preschool who has already been announced as the 2014 national Rising Star. Ms Ley congratulated the winners who were selected from a pool of 88 finalists from across Australia.